GESTA RHOMANO[RUM] CU[M] APPLICATIONIBUS MORALISATIS AC MISTICIS. [Strasbourg: [Johann Grüninger], 18. February 1488. Chancery Folio (28,5:20 cm). 100 leaves [1 leaf (title, complete text as cut out fragment mounted on new yellow paper)], 93 leaves (headed »Folium Primum« to »Folium XCIII«), [6 leaves (headed »Tabula Generalis« (2) and »Tabula Alphabetica« (4)]. Signatures: a1 a2-b⁸ c⁶ d⁸ e⁶ f⁸ g⁶ h⁸ i⁶ k⁸ l⁶ m-n⁸ o⁶. New binding with marbled boards, yellow end papers and yellow edges. 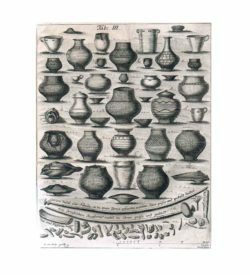 Particularly scarce print of the »Gesta Romanorum«, a corpus of illustrative fiction set in Ancient Rome. 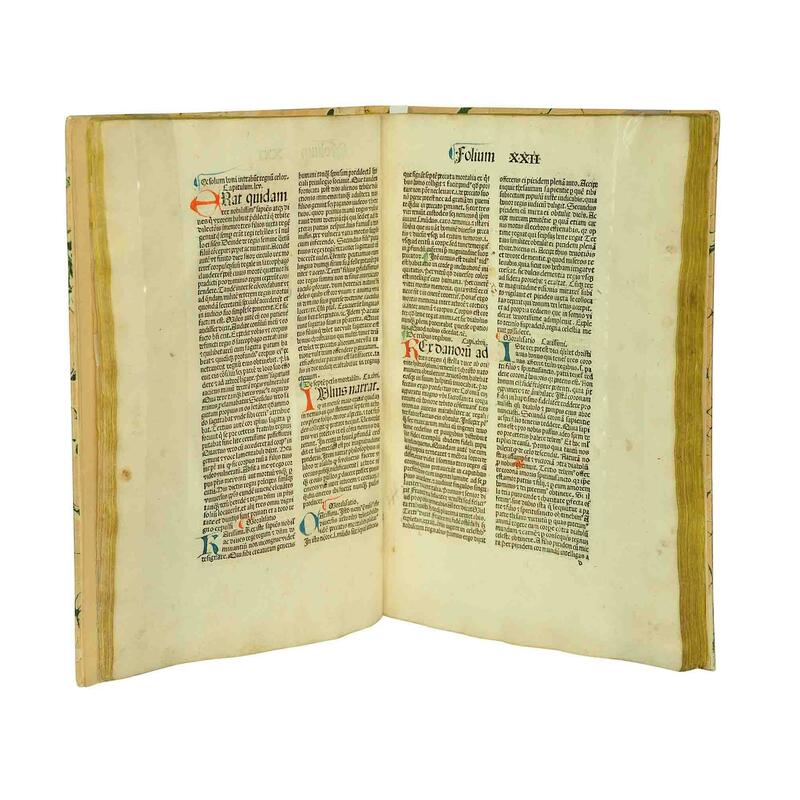 Contents: Compiled by monks after varying sources during the late middle ages and all pointing to a moral, the texts were mainly for the use of preachers. 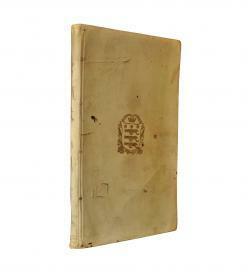 Editions of the »Gesta« with much varying contents where among the bestsellers of the incunabula age. For the present edition of 1488 Johann Grüninger used the typeset of a 1485 Strasbourg edition of Martin Schott a reprinted sheets and pages accurately (see GW). Present copy is one of few with continuous rubrication by hand using Lombard initials and paragraph signs in red, blue and green, many of the initials with fleunonée. Clean and precise print with gothic letters in two columns of 50 lines each, beautifully typeset with wide margins on strong mould paper. Provenance: Archduke Franz Ferdinand of Austria, with his library stamp on leaf n3r: „Privatbesitz Franz Ferdinand von Österreich-Este“; Hohenberg family. Condition: Early inscriptions or little drawings with ink on leaves a3r, a4r, a7r, e1r, h5r, i4v, k1v, k5r, k8r, k8v (6 lines of a German language poem), l4v, n1v, n2r, n7r. Fore margin of leaf o2 with fault (no text loss); lower right margins of leaves a2, a3, a4 and l2, as well as o6v torn and repaired, wormholes starting from leaves a2-h8 (at a2-b4 and e4-f3 stronger, with decreasing occurrence, otherwise very little, with repair of leaf a2); fore margins of a4-a6, a8-b8, m2-o6 with stronger water stains of different intensity, a number of leaves slightly finger-stained, foxy and with traces of dirt or colour. 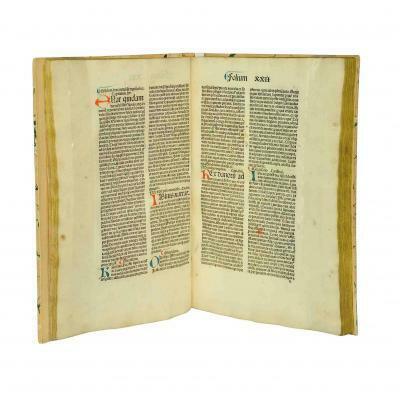 Holdings, Rarity: Rubricated copies of this incunabula are very rare indeed. ISTC quotes 56 copies worldwide in institutional holdings, whereof only 5 are described in the according catalogues as complete and rubricated throughout (Glasgow UL, BnF, BLB Karlsruhe, Stuttgart WLB and Czech NL). 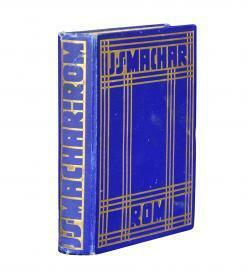 Only one copy of this edition of the »Gesta« was ever auctioned according to Jahrbuch der Bücherpreise (1906-38), Jahrbuch der Auktionspreise (1950ff.) und Auktionspreise online (ca. 1988ff.) 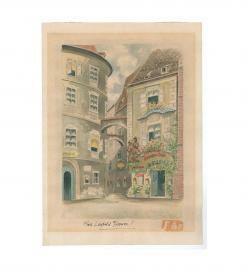 This copy was sold by Josef Baer & Co. (Frankfurt/Main) in October 1930 and was not rubricated. ABPC quotes one additional auction result since 1972, referring to a copy with 1 lombard initial in red only. References: GW IX, 10896; Goff G291; HC 7745*; GfT 2157; Pell 5254; Arnoult 699; Zehnacker 982; Polain(B) 1651; IBP 2400; Sajó-Soltész 1428; IBE 2660; CCIR G-29; IJL2 184; Madsen 1733; Šimáková-Vrchotka 812; Martín Abad G-44; Ernst(Hildesheim) I,I 210; Sack(Freiburg) 1569; Borm 1154; Schlechter-Ries 754; Voull(Trier) 1410; Voull(B) 2277; Walsh 163; Oates 182; Rhodes(Oxford Colleges) 844; Bod-inc G-152; Sheppard 362; Pr 450; BSB-Ink G-209; GW 10896.